This already seems to be the new trend in town, GSM Operators have assumed the position of spammers and marketing experts. Hardly can one have a peaceful 24hrs without getting those unwanted, unsolicited and extremely annoying text messages and calls from Telecom Service Providers. As the yeah 2013 draws closer to a halt, we have figured out some really helpful insight to help you put this silly trend under control. Now that you have identified the numbers? Prior to this time, we have discussed in details (link here) what seems to be a solution to Nigerian subscribers using the MTN services. If you are currently using an mtn line and would like to stop those annoying messages usually from 35685, 33113, 35020, 33115 and the rest of them, you can simply send “stop” as a text message to “33111“. This will remove you from their campaign database irrespective of the type of phone you used in sending the text message. This set of solutions should work for you irrespective of your mobile telecommunication services provider. It takes into account; apps, tips and tricks to put this annoying marketing campaigns under control. Using Nigerian based telecom services providers for example, you should already be familiar with these frequent occurring numbers; 4100 (usually from mtn), 4040, 8888 (usually from glo) and 8181 (usually from airtel). These numbers don’t matter much, all you need do is to take note of the numbers that is frequently used by the telecom services providers as you will be making use of it in the proceeding step below . Now that you have figured out the regular culprits, blocking them completely will no longer be an issue. In this part of our tutorial, we are going to list out 3 proven methods to blocking this numbers from calling or texting your line. This method will only work with smartphones, tabs and phablets. It is achieved by installing recommended mobile apps based on your mobile phone operating system. 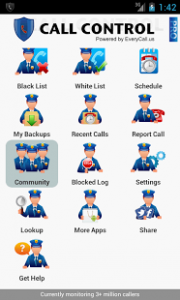 Now that you have installed the proper apps based on your mobile operating system, you need launch and locate the blacklist options, then add all the offending numbers to the blacklist and save. If you aren’t using your number for bank related activities, installing and activating this kinda apps should be the best option for you as it will block all private text messages, anonymous calls and SMS or calls from short code numbers and/or unknown sources. Calls and Messages from Spammers,telemarketers, debt collectors, marketers, politicians, advertisers and other unsolicited calls’ offenders will be automatically blocked when this feature is turned on. There are fewer apps with support for this feature for most mobile phone OS except for android that has a handful of such already including call blocker and Mr Number. Most phones including features phones has the feature to manually add numbers to your blacklist or “do not disturb” category. For smaller Samsung Java, Chinese Phones, Most Nokia and other feature phones that comes with this option, the settings can be found under settings ==> phone ==>Calls ==> blacklist, screen list or “do not disturb”. For Samsung Smartphones, Tecno Android , Gionee Android, HTC and other brands that comes with this feature, the settings can be easily located by going to ==> contacts ==> click on the number you wanna block (or manually create a group containing this disturbing numbers)==> click for more options and locate reject list or similar. For most android smartphones with this feature, you can also ==> tap and hold the number you wanna block from your call log list ==> select add to reject list or similar. We have covered the much we could on the topic of blocking spammers, telemarketers and stalkers, it is now left for you to pick up the one that works best for your phone and operating system. Do not forgot to share your experiences with the listed apps or other ones you might have had success with in the past, drop your questions and challenges too. Next ItemLink Spamming, Bots Registration on SMF Forum: How I Stopped them!